Niche line Keiko Mecheri will launch Embruns ('sea spray'), a new oriental chypre fragrance. The brand has also made a slight alteration in packaging — the bottles are the same, but the caps have been redesigned. The notes feature yuzu, Sansho (Sichuan) pepper, cardamom, salty notes, iris, suede, toasted tonka bean, cedar, sandalwood, incense, oak moss, vanilla and amber. 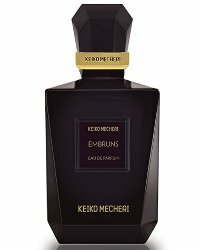 Keiko Mecheri Embruns will be available in 75 ml Eau de Parfum.